It's often difficult to know when you should get your furnace maintained and whether you should have your system repaired or replaced. While each situation is different, this guide will help you learn about the best time to service your furnace, problems you may encounter and whether to repair or replace your system in each scenario. As a homeowner in the Northern U.S., you likely understand the importance of having a fully operating furnace for the winter. A non-operative heating system can turn a frigid winter day into an uncomfortable crisis. There's nothing worse than waking up to a freezing home on a cold morning, and a loss of heat can even be dangerous to vulnerable family members such as children. More research time: When you choose to repair or replace your system before you need it for the winter, you have more time to research your options, compare units and shop around for estimates. Money savings: You may be able to save money on parts and labor when you repair or replace your furnace over the summer rather than during a season of high demand. More time for budget planning: A furnace is an immense investment for your home, and an early repair or replacement allows you the time to research financing options that won't be too hard on your wallet. While there are no set rules, there are some factors to keep in mind as you determine whether to keep your current furnace or upgrade to a more efficient model. Consider the following scenarios to help you decide whether you should repair your system or replace it entirely.Of course, no matter what time of year, the decision to repair or replace your furnace can be overwhelming. It's never a simple choice, and every situation is unique. Any system that could potentially expose you and your family to carbon monoxide needs to be replaced — not repaired — as soon as possible. A furnace with a cracked combustion chamber allows carbon monoxide to leak into your home and should always be replaced immediately. Known as the silent killer, carbon monoxide is an odorless, tasteless, colorless gas that causes death when inhaled over long periods of time. Between 2010 and 2015, over 2,200 people died from unintentional carbon monoxide poisoning. The highest number of deaths occurred in the winter during the months of frequent furnace use. Feelings of nausea, disorientation, headaches and other flu-like symptoms. If you notice any of these symptoms, you need to evacuate your home immediately, call the fire department, notify your utility company to turn off your gas and seek medical attention as soon as possible. Afterward, contact a heating professional to get your furnace replaced. Unfortunately, even the highest quality heating systems don't last forever. According to the U.S. Department of Energy, a furnace should last 15-30 years before you'll need a replacement. Of course, this varies by brand, furnace quality and various other factors. But a heater will generally start to show increased signs of wear that will lead to more frequent and costly repairs during this timeframe. Instead of continually monitoring an old system for repairs, it may be a more economical choice to replace the furnace with a newer system. If your furnace has been serviced a year ago or less and continues to need costly repairs, this may be a sign that your system is too old to function properly. Similar to a car with high mileage, an old furnace may run okay with minor repairs but won't be able to adequately keep up with your needs as efficiently as a replacement. However, if it was recently installed and hasn't reached its full lifespan potential, you should consider making repairs to keep it running as long as possible. Repair: If the system is less than 15 years old, it's often best to have it serviced rather than install a new one. Replace: Any system over 15 years old is prone to frequent and expensive repairs and may need to be replaced. When comparing the cost of a repair versus a replacement, experts recommend replacing your furnace when repair costs exceed 50% of the cost of a replacement as a general rule. But for older heating systems that have exceeded 75% of their life expectancy, you should consider purchasing a new furnace once repair costs exceed one-third of the replacement cost. Electric: $2,000 for standard efficiency, $4,400 for high efficiency. 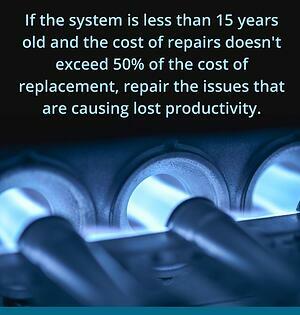 Repair: Repair a newer furnace if the repair would cost less than 50% of the replacement cost. Replace: Replace your furnace if it's beyond three-quarters of its life expectancy and a repair approaches one-third the cost of a replacement. Just like gas for your car, heating costs fluctuate year to year due to changes in weather patterns and supply and demand. But while this can explain some variation in your heating bill, you should still be alert to unusual spikes from month to month that coincide with your furnace use. Compare the cost of heating bills from the most recent heating season with bills from previous years. If you notice a significant difference in recent heating statements, your furnace is likely consuming too much energy. And if you're continuing to use your system economically and can't account for this increase, it's time to have your system serviced. Repair: If your furnace is less than 15 years old and the cost of repairs is less than half the cost of a replacement, have the inefficient parts repaired. Replace: A furnace at the end of its lifetime is likely to incur frequent repairs and steep heating costs. If you have an older system that would require costly repairs to maintain efficiency, consider having your furnace replaced. Have you noticed that some rooms in your house are warmer than others? Do you feel like you need to run back and forth adjusting the thermostat to stay comfortable in any given area? Does the air feel muggy or humid? If so, these might be signs that your furnace is losing its effectiveness. If your furnace felt less powerful this past winter than it did in previous years — despite similar temperatures and household routine — your system might be losing power, or you may have an outdated duct system that's struggling to distribute heat evenly through your home. If the system has continued to worsen after two heating seasons with no apparent cause, it may be time for maintenance. Repair: If the system is less than 15 years old and the cost of repairs doesn't exceed 50% of the cost of replacement, repair the issues that are causing lost productivity. Replace: If your furnace is nearing the end of its expected lifetime, repairs may provide a temporary fix to a problem that will increase over time. Consider replacing ineffective older systems. Like an old car, you know when your old furnace just isn't worth the cost of excessive maintenance. If you've had the same system for over 15 years that has only needed repairs once or twice but you now find yourself calling a heating specialist once every few months, this indicates that your furnace isn't worth the cost of upkeep. Likewise, you may need to consider purchasing a new heating system if repair costs are increasing with each repair. You can expect future maintenance to be more severe and frequent once a furnace has reached its life expectancy, which puts an unnecessary strain on your wallet. It's often more cost effective to install a brand new system than to patch an existing broken-down one. However, if you notice frequent or serious breakdowns in a newer furnace that is well within its expected lifespan, this could mean that the problem is being misdiagnosed or mistreated. If you have a younger system that's needed two or three repairs in the past couple of years, consider contacting a different heating specialist to get another opinion on the root issue. Repair: Repair if your furnace needs minor maintenance such as low airflow, water leaks or thermostat repairs, and get a second opinion for repeated repairs of a newer system. Replace: Replace your system entirely for major repairs such as a damaged heat exchanger or control module, and replace old systems that need frequent maintenance. Nearly all furnaces make noise when turned on or off, but if yours is making unexpected noises that get increasingly louder, this could be a warning sign that it's time for a new system. Pay attention to the type of noise you hear — such as rattling, popping, screeching or humming — and where the sound is coming from so that you can describe it to a repair specialist. Noises could stem from various issues such as unsecured ductwork, an unbalanced motor, motor failure or deteriorating parts. Each problem ranges in severity, making some repairs more crucial than others. Repair: A new system should be repaired if possible to preserve it for the remainder of its life expectancy. 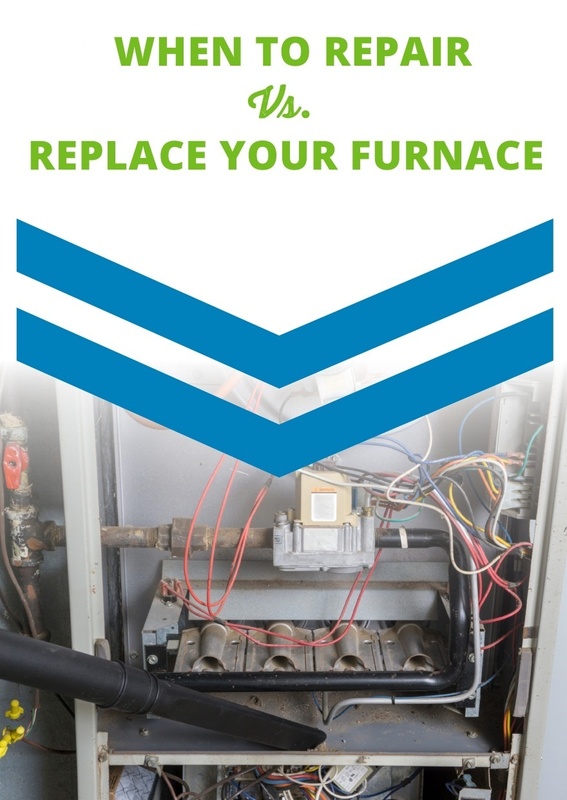 Replace: If your system is already over 15 years old and requires maintenance for deteriorating parts, it'll likely be more cost effective to replace the entire furnace. Homebuyers look for the best possible investment when considering their options and often make their decision based on a property's number of favorable features. Furnaces are the most common space heating option in the U.S., which makes a functioning, efficient furnace an indispensable asset. Replacing your furnace probably won't increase your home's value, but it can still be vital towards your success in selling your home. An out-of-date heating system that has reached the end of its life expectancy will likely need to be replaced during the inspection process. At best, failure to replace an old system could cause buyers to ask you for a reduced asking price, and at worst, it could keep potential buyers from being able to make an offer on your home altogether. If your furnace has been performing poorly and you're thinking about selling your home in the next two or three years, a new system can be an attractive investment for yourself as well as your home's prospective buyers. In the short term, you can receive the benefits of a more efficient heating system and reduced heating bills in the two or three years you're living in your house. And when you do sell your home, a recent furnace installation will attract prospective buyers, assuring them that they won't have to replace the system for years to come. Repair: If real estate values are low in your region, it may be more economical to make simple repairs that allow your system to function and pass inspection for the remainder of your time in your current home. Replace: An outdated system should be replaced to pass inspection and satisfy buyers. If you're nearing retirement, a new furnace can be a beneficial investment. When you replace your old heating system as you approach retirement, you can enjoy the comfort, efficiency and cost savings of your new furnace for years to come without worrying about system failure, and you may never have to replace your system again. Not only does an efficient furnace allow you to be more comfortable in your home, but a functioning heat source also becomes critical to your health as you age. According to the National Institute on Aging, older adults can suffer symptoms of hypothermia by merely being in a cold house. The best choice to avoid taking a toll on your health or the safety of older family members is to install a new furnace that will keep your home warm with maximum efficiency. Repair: Make repairs as necessary if you have a newer or high-efficiency system that isn't nearing the end of its lifespan. Replace: Consider replacing an old furnace with a higher efficiency model, especially if you or an older loved one have a history of illnesses. 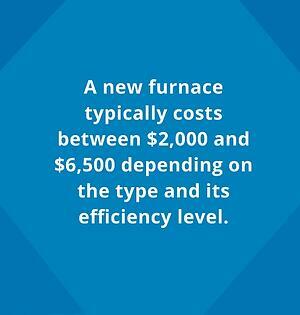 A high-efficiency furnace installation is a substantial initial investment, but it may be well worth the price. Installing a high-efficiency system can make you eligible for state and local tax credits. Local utility companies also offer incentives with the purchase of a high-efficiency furnace. You'll be able to enjoy these one-time rebates while also benefiting from savings on your heating bill every month, which may help offset the cost of the initial installment. Learn more about the tax credits and rebates available in your area by contacting your local utility company or checking the Database of State Incentives for Renewables and Efficiency. One of the hardest parts of repairing your furnace is finding an expert you can trust. If you own a home in Connecticut, Delaware, Maine, Maryland, Massachusetts, New Hampshire, New Jersey, New York, Pennsylvania or Rhode Island, Smart Touch Energy is here to help you with your furnace repair needs. Homeowners across the Northern U.S. have trusted Smart Touch Energy for their heating oil needs for over 80 years. Although the company was founded to provide people with affordable heating oil and hassle-free service, our services have expanded to address a variety of heating concerns. If you find yourself in need of a furnace repair, our expert technicians will fix your issue as soon as possible. If you have an oil-burning furnace, regular cleaning and preventive maintenance are essential towards preventing future problems once your repair or replacement is complete. We also offer oil burner cleaning services to ensure that your furnace is in top condition before the cold fall and winter months. These services not only allow your system to run at peak efficiency, but they also make your home safer by checking and preventing issues related to carbon monoxide poisoning. No matter whether or not your furnace needs maintenance or repairs, Smart Touch Energy is your trusted source for convenient online heating oil purchases, as well as emergency oil services. Whatever you need, turn to Smart Touch Energy to help you make informed decisions regarding your furnace and heating oil needs. Contact us today for more information about our services, or check out our list of service areas to find pricing information for your region.